Background: Elevated waist circumference and body mass index (BMI), both traditional measures of obesity, are accepted risk factors for type 2 diabetes mellitus. Girls who are obese experience earlier onset of puberty and possibly greater breast development. We sought to evaluate whether a woman's breast size in late adolescence is associated with an increased risk of type 2 diabetes mellitus in adulthood. Methods: In conjunction with the ongoing Nurses' Health Study II, which began to study risk factors for breast cancer among women in 1989, we conducted a prospective cohort study involving 92 106 of the participants. We assessed the risk of type 2 diabetes mellitus in relation to self-reported bra cup sizes, categorized as ≤ A, B, C and ≥ D cups, among participants at age 20. Results: The mean age of participants at baseline was 38.1 years. A total of 1844 new cases of type 2 diabetes mellitus arose at a mean age of 44.9 years during 886 443 person-years of follow-up. Relative to bra cup size ≤ A, the respective age-adjusted hazard ratios (and 95% confidence intervals [CIs]) were 2.30 (1.99–2.66) for B cup, 4.32 (3.71–5.04) for C cup and 4.99 (4.12–6.05) for ≥ D cup. Upon further adjustments for age at menarche, parity, physical activity, smoking status, diet, multivitamin use, family history of diabetes mellitus, BMI at age 18 and current BMI, the corresponding hazard ratios (and 95% CIs) were 1.37 (1.18–1.59) for B cup, 1.80 (1.53- 2.11) for C cup and 1.64 (1.34–2.01) for ≥ D cup. The addition of waist circumference to this model minimally changed the hazard ratios (and 95% CIs): 1.32 (1.14–1.53) for B cup, 1.71 (1.46–2.01) for C cup and 1.58 (1.29–1.94) for ≥ D cup. Interpretation: A large bra cup size at age 20 may be a predictor of type 2 diabetes mellitus in middle-aged women. Whether this relation is independent of traditional indicators of obesity remains to be determined. Although an elevated body mass index (BMI)10,11 and central adiposity12 are established risk factors for insulin resistance and the onset of type 2 diabetes mellitus, little is known about the contribution of extra-abdominal adipose tissue, including breast tissue, about 60% of which is fatty tissue, to this process.13,14 We hypothesized that a woman's breast size in late adolescence reflects her predisposition to insulin resistance and type 2 diabetes mellitus that is both additive to, and independent of, BMI. We explored this hypothesis in conjunction with the Nurses' Health Study II by relating bra cup size, a proxy for breast size, to the onset of type 2 diabetes mellitus. The Nurses' Health Study II is a prospective cohort study, which was initiated in 1989 and is ongoing. The study involves 116 609 women, more than 90% of whom are white, from 14 US states.15 At the time of enrolment, participants were between the ages of 25 and 42, and they completed a detailed baseline questionnaire about their health, lifestyles and anthrometric characteristics. They continue to complete follow-up questionnaires on a biennial basis. We included all women who had concomitant information about bra cup size at age 20 and BMI at age 18, for a total of 92 106 participants. We excluded women who had already received a diagnosis of diabetes mellitus or who had a history of gestational diabetes. Our study was approved by the Human Research Committees at the Harvard School of Public Health and the Brigham and Women's Hospital in Boston, Massachusetts. Bra cup size is traditionally determined by measuring the horizontal chest circumference just under the breasts, adding 5 inches (12.7 cm) and subtracting the total from the horizontal chest circumference at the fullest part of the breasts. A net difference of 1 inch is equivalent to an A cup, 2 inches a B cup, 3 inches a C cup and 4 inches a D cup.16 On the 1993 Nurses' Health Study II questionnaire, women were asked to recall their bra cup size at age 20 and indicate whether it was an A cup or smaller, B cup, C cup, or a D cup or larger. Those who did not wear a bra were asked to estimate their bra cup size.17 Participants were not asked to formally measure their chest circumferences. Study participants completed a food frequency questionnaire every 4 years; its reproducibility and validity have been confirmed.23 We calculated a dietary score for each woman based on her intake of trans fats and cereal fibre, the ratio of polyunsaturated fat to saturated fat and the glycemic load. The scores ranged from 1 to 5, with a higher score predicting a lower risk of diabetes.24 The scores for the individual dietary factors were summed, and the mean composite score is presented herein. Participants reported multivitamin use as “yes” or “no.” On the 1991 and 1999 questionnaires, the Nurses' Health Study II participants reported data on physical activity, which we assessed by calculating the total number of hours per week that participants engaged in moderate to vigorous activities from a specified list. The reproducibility and validity of this method have been confirmed.25 Participants reported past and current smoking history on each biennial questionnaire. Parity was based on the number of pregnancies that lasted longer than 6 months. Participants reported information about pregnancy at the time of enrolment and on each subsequent biennial questionnaire. They reported their age at menarche on the 1989 questionnaire. We determined the cumulative number of months of lactation using the total number of months from each delivery to cessation of breastfeeding, as reported on the 1993, 1997 and 2003 questionnaires. Finally, participants reported family history of diabetes mellitus on the 1989 and 1997 questionnaires. We excluded participants who did not report bra cup size or BMI at age 18. We began our analysis of participants' data when they returned the 1993 questionnaire reporting bra cup size and ended the analysis for each participant upon diagnosis of type 2 diabetes, death or the end of the study period in 2003, whichever occurred first. We used a Cox proportional hazards model to generate an age-adjusted hazard ratio and 95% confidence interval (CI) to determine the risk of type 2 diabetes in relation to BMI at age 18, using the lowest BMI quintile as the reference group. We then expanded our analysis to include age at menarche, parity, cumulative number of months of lactation, hours per week of physical activity, smoking status, mean dietary score, multivitamin use, family history of diabetes mellitus in 1989 and bra cup size at age 20. We developed 5 models (models A to E) to determine the relation between bra cup size and risk of diabetes. We used a Cox proportional hazards model to generate an age-adjusted hazard ratio and 95% CI, comparing women who wore B cups or larger with women in the reference group (≤ A cup). In model A, we adjusted for current age, age at menarche, parity (0, 1, 2, ≥ 3), cumulative number of months of lactation, hours per week of physical activity (< 1, 1 to < 2, 2 to < 4, 4 to ≤ 7 and > 7), smoking status (never, past, 1–14 cigarettes/d, 15–24 cigarettes/d, ≥ 25 cigarettes/d), mean dietary score (1–5), multivitamin use (yes or no) and the presence of a family history of diabetes in 1989. Model B, the main analysis, expanded upon model A and included adjustment for BMI at age 18. In model B, we evaluated the relation between bra cup size and type 2 diabetes among each BMI quintile at age 18 years. We evaluated whether model B (the stratified model) better determined the relation between BMI and bra cup size than model A (the nonstratified model) using a likelihood ratio test. Because of the broad range of BMI values within each quintile, it was necessary to adjust for BMI as a continuous variable among the groups to avoid within-group confounding. We adjusted model C to include participants' most recent BMI. Model D included an adjustment for change in weight (in kilograms) between age 18 and age at the time of completing the most recent biennial follow-up questionnaire; however, it did not include an adjustment for most recent BMI. Model E included both an adjustment for most recent BMI and waist circumference in 1993 in addition to the adjusted variables in model B. Of the original cohort of 116 609 women enrolled in the Nurses' Health Study II, we excluded 2032 women for whom there were a number of missing variables, and we excluded a further 22 081 women because of a lack of information on bra cup size. We excluded an additional 390 women because of a history of gestational diabetes or because they had already received a diagnosis of diabetes. We included a total of 92 106 women in our analysis. The mean age at baseline (1993) was 38.1 years. BMI at age 18 years and in 1993, and waist circumference in 1993, increased in a linear fashion with larger bra cup size (Table 1). The mean score for body fat in childhood also increased with bra cup size at age 20 (Table 1). Conversely, women with a larger bra cup size were younger at menarche than women with the smallest cup size (reference group). Women in the largest bra cup size category were about 4.1% more likely to be nulliparous than women in the smallest category (Table 1). The proportion of participants with a family history of diabetes was higher among women with larger bra cup sizes than among those with the smallest cup size. Women with larger bra cup sizes were more likely than those in the smallest category to have smoked. 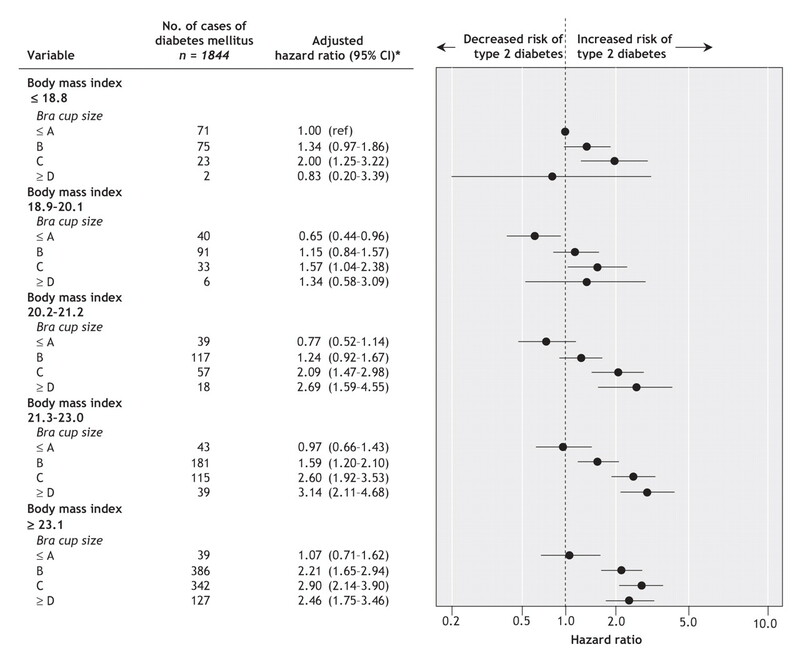 During 886 443 person-years of follow-up, 1844 incident cases of type 2 diabetes were reported. Relative to the group with the lowest BMI at age 18 years (≤ 18.8), the age-adjusted hazard ratios (and 95% CIs) for type 2 diabetes mellitus were 0.94 (0.76–1.16) for the 18.9–20.1 BMI group, 1.33 (1.09–1.62) for the 20.2–21.2 BMI group, 2.14 (1.79–2.56) for the 21.3–23.0 BMI group and 5.05 (4.29–5.95) for the ≥ 23.1 BMI group. After adjustment for age, age at menarche, parity, cumulative number of months of lactation, hours per week of physical activity, number of cigarettes smoked per day, mean dietary score, multivitamin use, family history of diabetes mellitus in 1989 and bra cup size at age 20, the covariable-adjusted hazard ratios (and 95% CIs) were 0.88 (0.71–1.09) for the 18.9–20.1 BMI group, 1.15 (0.94–1.40) for the 20.2–21.2 BMI group, 1.64 (1.36–1.97) for the 21.3–23.0 BMI group and 2.94 (2.47–3.50) for the ≥ 23.1 BMI group. The onset of diabetes was 2.1 years earlier among women who wore a D cup or larger (mean 43.7 years) compared with those who wore an A cup or smaller (mean 45.8 years). Relative to the smallest bra cup size, the age-adjusted hazard ratios were 2.30 for B cup, 4.32 for C cup and 4.99 for D cup or larger (Table 2). These risk estimates were slightly attenuated after we adjusted for the covariables in model A. Additional adjustment for BMI at age 18 (model B) and current BMI (model C) attenuated the associations further, but the risk of diabetes mellitus remained significantly higher with increasing cup size (Table 2). After adjusting for BMI at age 18 and weight change, we found that the relative risk of type 2 diabetes was 1.41 (95% CI 1.21–1.63) times higher among women who wore a B cup, 1.85 (1.58–2.18) times higher among women who wore a C cup and 1.71 (1.39–2.10) times higher among women who wore a D cup or larger, as compared with women who wore an A cup or smaller (model D, Table 2). Including the square of BMI at age 18 in model D did not alter these risk estimates (data not shown). When we adjusted for both waist circumference in 1993 and most recent BMI (model E), we found that the risk of type 2 diabetes changed minimally, with a hazard ratio (and 95% CIs) of 1.32 (1.14–1.53) for B cup, 1.71 (1.46–2.01) for C cup and 1.58 (1.29–1.94) for ≥ D cup (Table 2). Compared with women in the group with the lowest BMI at age 18 who wore an A cup or smaller, women who were in the 21.3–23.0 BMI group and wore a D cup or larger had about a 3 times higher risk of type 2 diabetes (hazard ratio 3.14, 95% CI 2.11–4.68). Women who were in the ≥ 23.1 BMI group and wore a D cup or larger had a hazard ratio of 2.46 (95% CI 1.75–3.46) (Figure 1). We found that the interaction between BMI quintile at age 18 and bra cup size was not significant (p = 0.90). Figure 1: Forest plot showing risk of type 2 diabetes mellitus in relation to body mass index and bra cup size among 92 106 women involved in the Nurses' Health Study II. *Model B: adjusted for age, age at menarche, parity, cumulative no. of months of lactation, physical activity, smoking status, mean dietary score, multivitamin use, family history of diabetes and body mass index at age 18. CI = confidence interval, ref = reference group. In our prospective cohort study involving young and middle-aged women, we found that a larger bra cup size at age 20 predicted the onset of type 2 diabetes. Bra cup size, a simple, easily ascertained measure, explained the association beyond the well-established measure of BMI. The association held true within all BMI groups and also appeared to follow a dose–response relation. The association also persisted after we adjusted for other risk factors for type 2 diabetes, such as family history of diabetes mellitus, diet and exercise. Furthermore, by developing 5 separate models to determine the relation between bra cup size and risk of diabetes, each model adjusting for different covariables, we found that the relative risk of diabetes was greater among women with larger bra cup sizes than among those in the reference group (≤ A cup size) in all models (Table 2). This finding illustrates that, whatever the approach to adjustment, there may be additional benefit to include breast size in the assessment of risk factors for type 2 diabetes. If our findings prove to be true, they raise a number of new questions about the pathogenesis of type 2 diabetes. Although it is not known whether adipose tissue in the breast contributes to the pathogenesis of insulin resistance, posterior chest adiposity — marked by a high ratio of subscapular to triceps skinfold thickness — is positively correlated with insulin resistance and type 2 diabetes.28 The storage of steroid hormones within breast tissue, and the behaviour of breast tissue as a paracrine and autocrine organ, including expression of insulin-like growth factor-I by mammary adipocytes, has been widely discussed in relation to breast cancer,29,30 but not in relation to diabetes. Adiponectin and leptin — hormones produced by adipose tissue that are responsible for regulation of glucose and fatty acid metabolism and appetite — have recently been found to be secreted in breast milk.31,32 Whether these hormones are expressed in breast tissue of nonlactating women remains unknown. Thus, while abdominal visceral obesity is known to contribute to the development of insulin resistance,3,12 the additional action of hormonally active breast adipose tissue within this process requires elucidation. We hypothesized that prepubertal obesity may accelerate and exaggerate the normal state of insulin resistance seen in puberty.33 Although we did not directly test this hypothesis, the observed positive association between self-rated body fat in childhood (especially at age 10) and bra cup size, and the inverse association between age at menarche and bra cup size, is consistent with this concept.5,6 Breast size after puberty may also be a marker of postpubescent excessive insulin secretion and hyperandrogenemia.8,9 It is thus conceivable that breast size in early adulthood (e.g., at age 20) is a marker of childhood adiposity and peripubertal insulin resistance, which may continue into adulthood. A cross-sectional study of the relation between breast volume determined by magnetic resonance imaging, markers of insulin resistance, and the metabolic syndrome among pre-and postpubertal women could clarify the mechanisms by which breast adiposity may predispose a young woman to type 2 diabetes.34 In addition, an accurate evaluation of chest adiposity in men and women may help decipher the degree to which breast fat tissue28 versus extra-abdominal fat contributes to the overall risk of insulin resistance and type 2 diabetes. Consideration of ethnic background and socioeconomic status in each of these studies is also recommended. In summary, we documented a statistically significant association between bra cup size and the development of type 2 diabetes. We believe that our findings should be reproduced in other settings, and in studies involving women of different ethnic backgrounds. Finally, the mechanisms underlying the potential risks and health consequences of obesity in the upper and lower torso require additional research. Contributors: All of the authors participated in the design, analysis and writing of the paper, and reviewed and approved the final version. Acknowledgements: We thank Dr. Meir Stampfer for helpful suggestions on the analyses. Joel Ray is supported by a Canadian Institutes of Health Research New Investigator Award. This analysis was completed with financial support from the Departments of Medicine and of Obstetrics and Gynecology, and the Research Division at St. Michael's Hospital. The Nurses' Health Study II is supported by Public Health Service research grant CA50385 from the National Cancer Institute, National Institutes of Health, Department of Health and Human Services. The sponsors had no involvement in or control over the design and conduct of the study; the collection, analysis and interpretation of the data; the preparation of the data; or the preparation, review and approval of the manuscript. O'Sullivan JB. Body weight and subsequent diabetes mellitus. JAMA 1982;248: 949-52. Colditz GA, Willett WC, Stampfer MJ, et al. Weight as a risk factor for clinical diabetes in women. Am J Epidemiol 1990;132:501-13. Sinha R, Fisch G, Teague B, et al. Prevalence of impaired glucose tolerance among children and adolescents with marked obesity. N Engl J Med 2002;346:802-10. Galli-Tsinopoulou A, Karamouzis M, Nousia-Arvanitakis S. Insulin resistance and hyperinsulinemia in prepubertal obese children. J Pediatr Endocrinol Metab 2003;16:555-60. Biro FM, Lucky AW, Simbartl LA, et al. Pubertal maturation in girls and the relation to anthropometric changes: pathways through puberty. J Pediatr 2003;142:643-6. Kaplowitz PB, Slora EJ, Wasserman RC, et al. Earlier onset of puberty in girls: relation to increased body mass index and race. Pediatrics 2001;108:347-53. Ibanez L, Potau N, Zampolli M, et al. Hyperinsulinemia and decreased insulin-like growth factor-binding protein-1 are common features in prepubertal and pubertal girls with a history of premature pubarche. J Clin Endocrinol Metab 1997;82: 2283-8. Johnson MS, Figueroa-Colon R, Huang TT, et al. Longitudinal changes in body fat in African American and Caucasian children: influence of fasting insulin and insulin sensitivity. J Clin Endocrinol Metab 2001;86:3182-7. Folsom AR, Jacobs DR Jr, Wagenknecht LE, et al. Increase in fasting insulin and glucose over seven years with increasing weight and inactivity of young adults. The CARDIA Study. Coronary Artery Risk Development in Young Adults. Am J Epidemiol 1996;144:235-46. Whitlock EP, Williams SB, Gold R, et al. Screening and interventions for childhood overweight: a summary of evidence for the US Preventive Services Task Force. Pediatrics 2005;116:e125-44. Deurenberg P, Yap M. The assessment of obesity: methods for measuring body fat and global prevalence of obesity. Baillieres Best Pract Res Clin Endocrinol Metab 1999;13:1-11. Despres JP. Abdominal obesity as important component of insulin-resistance syndrome. Nutrition 1993;9:452-9. Cruz-Korchin N, Korchin L, Gonzalez-Keelan C, et al. Macromastia: How much of it is fat? Plast Reconstr Surg 2002;109:64-8. Boston RC, Schnall MD, Englander SA, et al. Estimation of the content of fat and parenchyma in breast tissue using MRI T1 histograms and phantoms. Magn Reson Imaging 2005;23:591-9. Solomon CG, Hu FB, Dunaif A, et al. Long or highly irregular menstrual cycles as a marker for risk of type 2 diabetes mellitus. JAMA 2001;286:2421-6. Wright MC. Graphical analysis of bra size calculation procedures. Int J Cloth Sci Technol 2002;14:41-5. Kusano AS, Trichopoulos D, Terry KL, et al. A prospective study of breast size and premenopausal breast cancer incidence. Int J Cancer 2006;118:2031-4. National Diabetes Data Group. Classification and diagnosis of diabetes mellitus and other categories of glucose intolerance. Diabetes 1979;28:1039-57. Manson JE, Rimm EB, Stampfer MJ, et al. Physical activity and incidence of non-insulin-dependent diabetes mellitus in women. Lancet 1991;338:774-8. Troy LM, Hunter DJ, Manson JE, et al. The validity of recalled weight among younger women. Int J Obes Relat Metab Disord 1995;19:570-2. Rimm EB, Stampfer MJ, Colditz GA, et al. Validity of self-reported waist and hip circumferences in men and women. Epidemiology 1990;1:466-73. Salvini S, Hunter D, Sampson L, et al. Foodbased validation of a dietary questionnaire: the effects of week-to-week variation in food consumption. Int J Epidemiol 1989;18:858-67. Hu FB, Manson JE, Stampfer MJ, et al. Diet, lifestyle, and the risk of type 2 diabetes mellitus in women. N Engl J Med 2001;345:790-7. Wolf AM, Hunter DJ, Colditz GA, et al. Reproducibility and validity of a self-administered physical activity questionnaire. Int J Epidemiol 1994;23:991-9. Baer HJ, Colditz GA, Rosner B, et al. Body fatness during childhood and adolescence and incidence of breast cancer in premenopausal women: a prospective cohort study. Breast Cancer Res 2005;7:R314-25. Hussain Z, Roberts N, Whitehouse GH, et al. Estimation of breast volume and its variation during the menstrual cycle using MRI and stereology. Br J Radiol 1999;72:236-45. Haffner SM, Stern MP, Hazuda HP, et al. Upper body and centralized adiposity in Mexican Americans and non-Hispanic whites: relation to body mass index and other behavioral and demographic variables. Int J Obes 1986;10:493-502. Osborne CK, Coronado EB, Kitten LJ, et al. Insulin-like growth factor-II (IGF-II): a potential autocrine/paracrine growth factor for human breast cancer acting via the IGF-I receptor. Mol Endocrinol 1989;3:1701-9. Rose DP, Komninou D, Stephenson GD. Obesity, adipocytokines, and insulin resistance in breast cancer. Obes Rev 2004;5:153-65. Bronsky J, Karpisek M, Bronska E, et al. Adiponectin, adipocyte fatty acid binding protein, and epidermal fatty acid binding protein: proteins newly identified in human breast milk. Clin Chem 2006;52:1763-70. Weyermann M, Beermann C, Brenner H, et al. Adiponectin and leptin in maternal serum, cord blood, and breast milk. Clin Chem 2006;52:2095-102. Potau N, Ibanez L, Rique S, et al. Pubertal changes in insulin secretion and peripheral insulin sensitivity. Horm Res 1997;48:219-26. Gautier JF, Mourier A, de Kerviler E, et al. Evaluation of abdominal fat distribution in noninsulin-dependent diabetes mellitus: relation to insulin resistance. J Clin Endocrinol Metab 1998;83:1306-11. Lau DC for the Canada Clinical Practice Guidelines Expert Panel. Synopsis of the 2006 Canadian clinical practice guidelines on the management and prevention of obesity in adults and children CMAJ 2007;176:1103-6.